MANILA, Philippines — Labor organizations, including those representing overseas and government workers, will stage what they vow to be widespread protests on May 1 to highlight what they call the worsening situation of Filipino workers under the Duterte administration. At a press conference, Migrante spokesman Arman Hernando, GOURAGE president Ferdinand Gaite, Rey Cagomoc of Kilos Manggagawa and Jerome Adonis, secretary general of Kilusang Mayo Uno, blamed the situation on the failure of President Rodrigo Duterte to fulfill one of his core promises, end labor cotractualization. He said the impact of this failure affects not only labor but all sectors. “Ang sinabi niya anumang uri ng contractualization wakasan, ngunit hanggang ngayon patuloy itong nagpapahirap sa manggagawa (He said he would end all forms of contractualization, but until now it continues to oppress the workers),” Cagomoc said. In fact, the labor leaders said, Department of Labor Order No. 174 has only served to legitimize labor contracting. On top of this, the labor leaders said, the administration has refused to increase the minimum wage even if, they claimed, it can well afford to. For several years, labor has demanded a daily minimum wage of P750 for the private sector and a base monthly pay of P16,000 for the public sector. They said it is not enough for Duterte to open the dialogue on these concerns because the workers need to feed themselves and their families. Aside from accusing Malacanang of buckling to pressure from big business and foreign investors, they also blamed what they called the inutility of Labor Secretary Silvestre Bello III, who they called on to resign. Adonis belied Bello’s claim his hands were tied on the issue of contractualization. “Sinasabi lang niya ‘yun. Ang paglalabas ng (department order) ang nagtuturo sa kapitalista sa kontraktwalisasyon … job contracting itinuring nyang ligal (He’s just saying that. 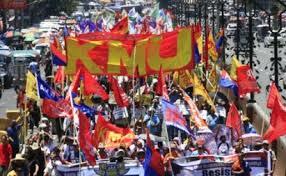 The issuance of the order instructs capitalists on contractualization … he considers job contracting legal),” Adonis said. The labor groups said they would begin staging protests in the run-up to May 1.